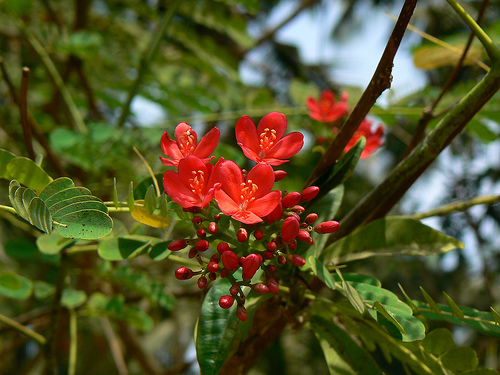 A versatile shrub that can be grown as a bush, container specimen, or small tree, Jatropha bears small, vibrant, vermilion flowers. As these appear on the current year’s growth, the plant can be pruned regularly to increase and prolong the flowering period although it will often flower throughout the year with little or no maintenance. Despite having low salt-tolerance, Jatropha integerrima is drought tolerant and can be used in xeriscape planting schemes. Widely available, it can also be propagated from woody stem cuttings or from seed which can be collected from dried seedheads that appear on the plant. Jatropha grows best in full sun. Being a member of the family Euphorbiaceae, Jatropha has latex-like sap that is an irritant and all parts of the plant are toxic if ingested.